This award was established by the family of Dr. Bruce M. Eberhart to honor exceptional students in the Biology Department who are academically excellent, actively involved in research, and demonstrate significant extracurricular contributions or service to the department, the university, the community as a whole, and even to fellow species they share the planet with. The award was established in 1997 to honor the memory and many contributions of Dr. Eberhart, a cancer victim, to the Biology Department and the community by honoring the students who are contributing to the department and the community in ways that were typical of him. 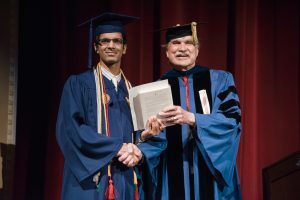 The award is presented to graduating senior biology students and consists of a cash honorarium and a book, which is chosen to represent contributions to science and humanity by outstanding individuals or biological scientists. This serves, then, as an inspiration to young biological scientists just starting in their careers. The Eberhart Award fund provides not only the cash honoraria but also scholarship support for undergraduate research. The book presented to the Eberhart Award winners in 2016 was LAB Girl by Hope Jahren, a plant scientist, three time winner of Fulbright Awards in geobiology, and is currently a full professor at the University of Hawaii. This book describes the journey of Dr. Jahren from a childhood in rural Minnesota to a renowned career in science. Thus, it represents we we look for in this award; an inspiring description of what makes a scientist to guide students with a modern degree in biology. Dr. Eberhart, with his broad interests, would have been deeply involved in these issues and that makes this book most suitable for this year’s Eberhart Award winners. Hassan Sheraz Ahmed — a member of Beta Beta Beta national honor society and has served as its president. He has received numerous university awards for outstanding academic achievement. He has been a research assistant in the laboratory of Dr. Karen Katula, contributing to the research activity of the Biology Department with his disciplinary honors research. He has also done research for Dr. Kimberly Petersen in the Department of Chemistry and Biochemistry. These efforts have resulted in numerous presentations. In addition to his academic achievements, he has an outstanding record of service to community. Hassan volunteers his time at the High Point Regional Health System assisting with patient care and working with health care practitioners. He has also worked in the Office of Leadership and Service Learning of the University for community service and outreach planning. He has been a tutor in the Tutoring and Academic Services Program providing resources to students to succeed in the classroom for challenging science courses in biology, chemistry, and physics. 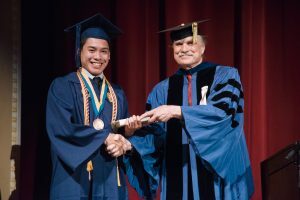 Louis Angelo Sulit — a member of Beta Beta Beta national honor society in biology. He is doing disciplinary honors research with Dr. Karen Katula, studying transcript levels of A and B promoters in two cancer cell lines. This work has resulted in numerous presentations including one at a meeting of the North Carolina Academy of Science. In addition to his contributions to the research efforts of the Biology Department, he has an outstanding record of volunteering and service. He volunteers with Teen Time at Glen Haven Community Center with activities for teenage and middle school students with an educational or leisurely focus. He volunteers at Moses Cone Hospital and at Duke Raleigh Hospital, assisting patients with same day surgery. He works with the Office of Leadership and Service Learning at the University. He has volunteered in the Meals for Migrant Workers program to serve dinner to migrant farm workers and their families in the Fuquay-Varina area from the St. Bernadette’s and St. Michael’s Churches.